As one of the legs of my passive income portfolio, I will be building a dividend growth portfolio. What is a dividend growth (DG) portfolio, you ask? A DG portfolio is a long-term investment strategy based around purchasing the shares of high quality companies who pay continually increasing dividends. My goal of this portfolio is to eventually increase this stream of dividend payments to an amount large enough amount to help fully cover my income needs in conjunction with my other passive income. What was your last raise at work? Was it 2-3%? With a solid DG portfolio, I will expect to see dividend increases between 6-9% per year on average. These increases will far exceed the rate of inflation providing me with a perpetual and every-rising dividend stream. So how am I going to get to the point where these dividends actually matter? By regular contributions, dividend reinvestment, and the aforementioned dividend growth. Speaking of a stream of dividend income, check out my dividend calendar and see how and when I’ve received dividends this year! Currently, I house my DG portfolio in two traditional investment accounts, a Roth IRA and a taxable account, with TradeKing, an online discount broker. 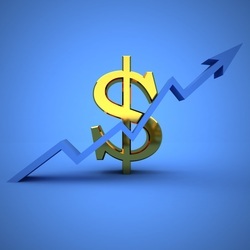 In 2014, I have added a third account to my dividend growth portfolio. I began to build a no-cost portfolio with Loyal3 and will be tracking my holdings separately from my other taxable investment account in the table below. One benefit of this portfolio is my ability to arbitrage my credit card rewards and receive essentially a discount on the shares purchased through Loyal3. After picking up the credit card rewards upon purchase, the ease in which you can selectively reinvest your dividends is pretty awesome too. Simply combine with new capital or make purchases once your account hits $10; Snowball City as I like to call it! UPDATE: Loyal3 will no longer be accepting credit cards as payments for new positions. As I am in the accumulation phase, and the idea being that these investments will compound, I will be updating my investments regularly through trade posts and monthly income updates; please find my most recent investment information below. After maintaining my dividend growth portfolio in a table using a simple plugin, I decided to upgrade the experience and use Google Docs instead. You can read more details about what exactly I am showing below here, but overall I show my holdings and forward 12-month dividends in two separate tabs on the spreadsheet below. Enjoy! One of the best ways to view a dividend growth portfolio is by the increase in forward 12-month dividends, as well as the progress in dividends received over time. The below chart reflects both since the beginning of 2013. I plan on updating this each time I complete a monthly passive income update. 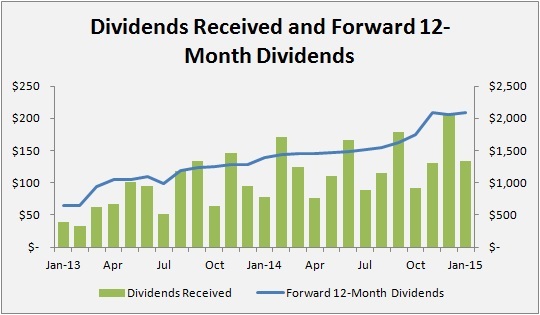 You can read more about forward 12-month dividends and how to calculate them in my post about Goal Setting – Forward 12-Month Dividends. If you have any questions about any of my holdings, or the overall concept of a dividend growth portfolio, feel free to ask! In your portfolio of companies who pay continually increasing dividends, are you allowed to compound (reinvest) dividends? Yes, as of right now I am currently reinvesting all of the dividends I receive from each company. If you’re interested, I wrote about doing this in a post earlier this year, To DRIP or not to DRIP, that is the question. I own several of the companies you own as well. I also like Loyal3, and hope they can add more companies to their list of commission-free investments. However, I do not reinvest dividends automatically. Rather I accumulate the cash dividends and contributions I make every month, and invest it in the best values I can find at the moment. Good luck in your dividend investing journey! Thanks DGI, always a pleasure to have you stop by the blog and certainly be fellow shareholders in some great companies! As for the reinvestment of dividends, once my accounts get a bit larger, I will stop the automatic reinvestment of dividends and instead focus on selective reinvestment. This will probably change the end of this year or the beginning of next year. Appreciate your support and thanks for stopping by! I am curious in your Loyal3 account, why do you not diversify just a bit more? The four stocks that you are investing in are solid for sure. Just wondering! 1) I just started this portfolio in January, and have only made three months worth of trades at this point. 2) Given the relatively limited options that meet my criteria (dividend growth stock, reasonably valued, yield greater than 2%, etc. ), these are the four companies that have met all or most of the criteria when making my monthly investment. As time goes on, I anticipate this portfolio expanding to other companies, but really see this as an extension of my regular dividend growth portfolio when it comes to my overall diversification. I spread myself around but may re-think this strategy and only concentrate of 5 to 6 stocks. My only non-dividend stock is BRK.B, which I auto-purchase monthly. My plan is to invest $300 to $500 per month in this portfolio and see where it goes over the next year or so. Hopefully, Loyal3 will continue to let us use credit cards. That is a nice bonus for sure. If they stop allowing this, I might just transfer this account to my Vanguard Brokerage account. You have made me think! I might follow your lead with this Loyal3 portfolio and concentrate on 5 to 6 stocks…. You have a very similar process to mine, as I am committing $300 per month in 2014 to Loyal3 and will make a determination at that point how I want to use the service going forward. Best of luck with your investments, both at Loyal3 and Betterment. I’m hoping we can continue to arbitrage the system for credit card rewards while investing in high quality companies at the same time. I thought I would follow up on this. Currently, I am buying BRK.B, TGT, MCD, and KO in this account. Using the credit card, I have automatic purchases set up for $50 per month in to each. I also do a manual purchase on each of them for a total monthly (including auto-invest) of $500.00. While I do not like the fact that you can’t really “time” your purchases, I think this is an excellent way to build a portfolio one step at a time. I also recently reached out to Loyal3 asking if they had any future plans to reinvest dividends. With the exception of FTR, no plans at this time. Too bad as I think this would be a great addition for their service. Thanks for the update Ray. I’m not as concerned with the direct reinvestment of dividends in this account because of the flexibility to reinvest at any point when the account holds $10 of cash. Once scaled up, this should be a pretty low threshold to cross that will allow one to invest pretty quickly with the available cash. You seem to have a pretty solid, high yielding portfolio with the various REITs included but I am wondering if you plan on adding a few other diversified names to your portfolio to spread the risk a bit. To me, your portfolio seems a bit concentrated. Just my 2 cents. I completely agree things are pretty limited as far as diversification goes. Since it is a small portfolio (at the moment), diversification is less of a concern in the now in the beginning. As I build it I am focusing adding many positions, across most sectors. Ideally, I will end up with between 40-50 holdings. Awesome stuff. That’s a good looking portfolio. And you have a lot of exposure to “Stage 1″ stocks, as I would expect due to its size. I’m confident that as you grow it you’ll increase your exposure to stocks with perhaps better growth profiles but lower yields. I followed a similar strategy to you where I went after stocks with higher yields, but still growing dividends, earlier on. That allowed the dividends to start to roll in nice and heavy right from the start. Certainly it started off with some high-yielding positions, but given the huge dip in REITS in 2013, they were attractively priced and a great place to put some money. With my 2014 transactions, I’ve started diversifying away from them and am picking up more traditional growth stocks. Over time as the portfolio grows, it will become much more well rounded. Thanks for your insight DM! Level3 sure seems to be a good deal. Can you always make fractional purchases? Best of all, seems like if you use a credit card, you could possibly get a cash back reward to start the ball rolling. So, no commission, but the timing is up to the broker? Can’t have everything. Seems like a good deal for long term portfolio building. Yup, no-cost transactions and credit card rewards for those who invest responsibly. Not a bad combination. Since I don’t try and time the market intraday, it really isn’t an issue for me to deal with the batch trading. Definitely ideal for someone looking long-term with solid companies. Thanks for the comment, Robert. Good looking portfolio and nice overall yield. I am looking to add some of those names to my portfolio soon. I need to add some stocks in the financial sector to have some exposure. I just bought Unilever this month. Keep it going! Thanks for your kind comments! I am glad to see you added UL and hope it turns into a successful position for you. Wow, you’ve built up quite a strong balance in your loyal 3 account in a very short space of time! Nice going!. I hope to drive more purchases through that account over the long term. I am planning on building this account up to $5,500 or so by the end of 2014. This will really set the stage for next year when it will organically produce almost $50 of dividends each quarter. That kind of production, dividend raises, the ease of selective reinvestment, regardless of any additional capital, and the account will begin to turn over on itself quite nicely. I am pumped to see where this one account is 3-5 years from now. As of now, I am planning on continuing to invest additional capital for the foreseeable future. nice DG..can you help me? What online broker do you have your DG.. I have sharebulder.. I currently use TradeKing and Loyal3 as my two brokers. At this point they fill my needs and meet my expectations. Ray, thanks for stopping by! I have checked into Motif, but at this point I’m not going to open another portfolio. Certainly the ability to create your own bucket of stocks and invest in them as a group is pretty attractive, but not something I’m going to pursue. Keep me posted if you do indeed play around with them. Did you see the news on ARCP? Thoughts? I did see the news, and while disturbing, at this point I am going to hang onto my shares and see what the future impact will be. Given the relative size of my position and the future growth of my portfolio, I am comfortable holding right now.